As a reluctant and tentative fan of Terry Pratchett’s writing, I always tiptoe into a children’s book, not sure what I’ll find. I was delighted to discover the first children’s book in The Bromeliad Trilogy was filled with humor, puns, social commentary, and a clever plot. 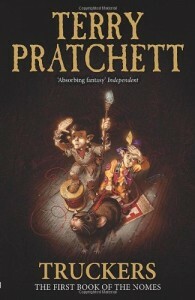 I admit to laughing out loud over some of the quirky things that Pratchett’s humor presents. The first book revolves around the ‘nomes’ discovering other nomes who live in a department store, convinced that is the entire world. Subsequently, they are eventually to leave and discover their real roots, from a planet far far away. So this children’s book is part social commentary, part science fiction. However, if you read it as pure fun, that is what you’ll get. I don’t know if my interest would hold for the other books in the Bromeliad Trilogy, since often a long-running joke gets old. But some children might stay with all three books; I don’t know. The humor requires a certain amount of sophistication, so I would say at least 10, if not 11, and up. Good writing and a satisfying commentary on life. The other two books are called Diggers and Wings.